Coll. No. 690.1, 8 Nov 2011, characters observed while keying: Annual, to 1 dm, glabrous, not tap-rooted; Leaves basal 0, cauline opposite, to 3 cm, 1 cm wide, not reduced above; Ovary inferior; Hypanthium, ±1 mm. (measured from ovary tip? to sepal base); Sepals 4, 3 mm; Petals 4, white to rose; Stamens 2 × 4 = 8, unequal; Stigma entire. Field Notes: Coll. No. 690.1. Notes to accompany the Checklist Flora of the Mono Lake basin. : Epilobium. 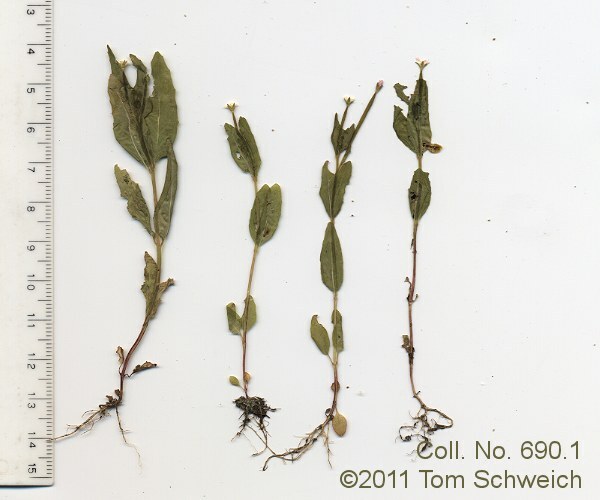 Other photos about Species or Onagraceae Epilobium ciliatum.